Pitcher Mountain Farm is about five minutes from our house, and it’s always been a big landmark for us. Whenever we see the furry cows, we are almost home. The views from there are spectacular, and the critters always look so happy. Frank stopped to talk to the farmer once when they had a calf out on the road, and I stop by fairly often these days, to stock up on hamburger. Until I started buying our beef from them, I had pretty much given up on eating hamburger at all, and we missed it. 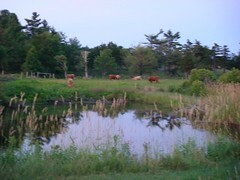 I was just too horrified by the stories in the press about beef processing that it didn’t feel safe enough to risk it. Really, though, doesn’t burgers on the grill just scream summer? I made these all doctored up, with onions, mushrooms and some of the Queso Blanco I made from raw milk yesterday, chopped up in the patties themselves. I remember an old Eddie Murphy sketch where he talked about how he wanted to go to McDonalds and his mother said “I’ll fix you up a burger” but it was filled with green peppers and huge onion chunks. I think I felt that way when I was younger too, but now? Bring on all the yummies in the patties, please. 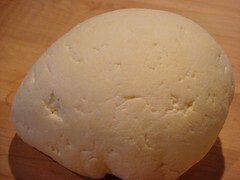 Queso Blanco is just the simplest cheese in the world to make. I grew up in the desert southwest, right on the Mexico border, and we used it in everything. It’s very different than most cheeses, in that it won’t melt, but gets all soft and yummy when heated, has a great flavor when made with raw milk, and additionally, takes on the flavors of what it is cooked with. So it was perfect in the burgers — didn’t run and make the grill ucky. Last night, I used it in enchiladas, finally making one that reminded me of home. For lunch today, I breaded some slices and fried them in butter. (Hey! When you farm, you can eat almost anything. All that physical labor has us the thinnest we’ve ever been in our adult lives, and yet I ate cheese fried in butter for lunch. Go figure! Mmmm.) 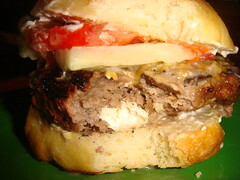 The tomatoes were from Bershear’s farm stand in Alstead, about five miles from us. Making our own hamburger buns is something I just started doing recently. I’ve been making our bread for a while now, but was buying hamburger and hotdog buns. But then I made the mistake of reading what goes into commercial bread these days, and just, um, no thanks. I’d been buying whole wheat rolls, thinking that was better in both taste and health than white industrial foam, but they are still chock full of high fructose corn syrup and so much other junk. So I found pans from King Arthur, which work wonderfully, and their recipe is fantastic. 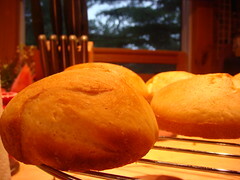 I mix a little potato flour and whole wheat, and add flax and sunflower seeds, and they come out great. To store, I’ve been double-bagging them in these Evert-fresh green bags that I bought years ago. I just wash them out and keep reusing them, and they work amazingly well on keeping produce fresh, and with the bread, it will last five days, easily. Perfect. 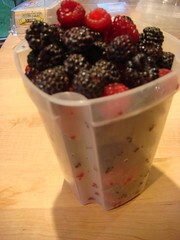 All of the local farm stands have black and red raspberries in season right now, but at $5 a pint, I thought I’d see how ours were doing down the driveway. I remembered that we hadn’t let the sheep go all the way to the end this year because it was too wet, and sure enough, I got quite a bit of fruit. Frank’s mother says her plants are doing really well this year too. I kept waiting for a break in the rain to go out there, but it never really came, so I picked them until I got soaking wet. At least I didn’t get bug bitten. They are so yummy on the raw milk yogurt I made, and sweetened with our own honey. 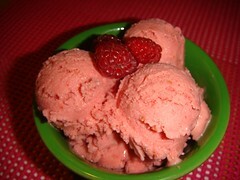 I also had enough raw milk and raspberries to make up a batch of ice cream. I of course used my Kitchen Aid ice cream attachment to make it, and it came out really well. (I so love that thing. It’s getting quite the work out this year. I’ve made so many different flavors of ice cream this summer.) 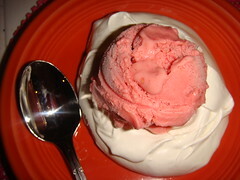 I used the standard recipe from The Ultimate Ice Cream Book, but something made it extra special: either the freshly picked raspberries, the raw milk, the farm fresh eggs, or all of the above. She suggests making meringue shells to serve the ice cream on, since the recipe calls for egg yolks only, which I decided was a really good idea. They took a long time to dry, though, with the humidity from all of the rain, so I’m not sure that was my brightest idea. I also found it too sweet that way, but very pretty! Wow, what a delicious-looking me. I’m nearly drooling!